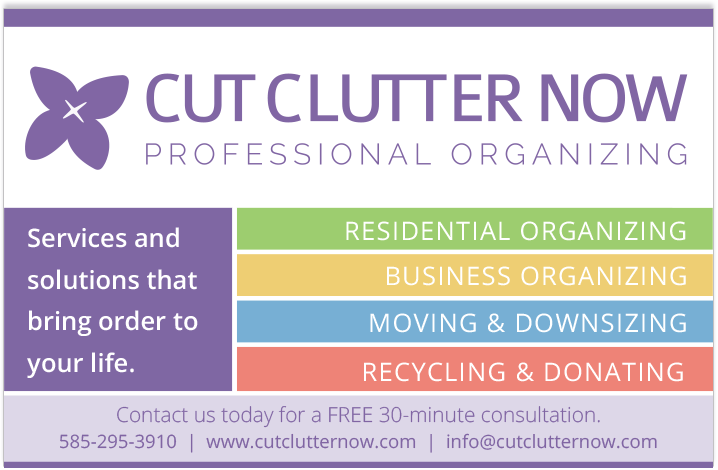 Cut Clutter Now is a professional organizing company that serves the Rochester, NY area. I worked with Cut Clutter Now to develop a visual identity system and accompanying collateral. The resulting work showcases Cut Clutter Now as a local company with a clean, bright and cheery identity that will help bring order and reduce clutter in clients’ lives. Cut Clutter Now came to me to help develop their visual identity as they were starting out. I created the logo, color scheme and overall visual identity. Since the initial work, I have helped to update the website and other promotional materials. This has been a solo project. The initial concept for the logo and direction for branding came from Cut Clutter Now and I ran with it. 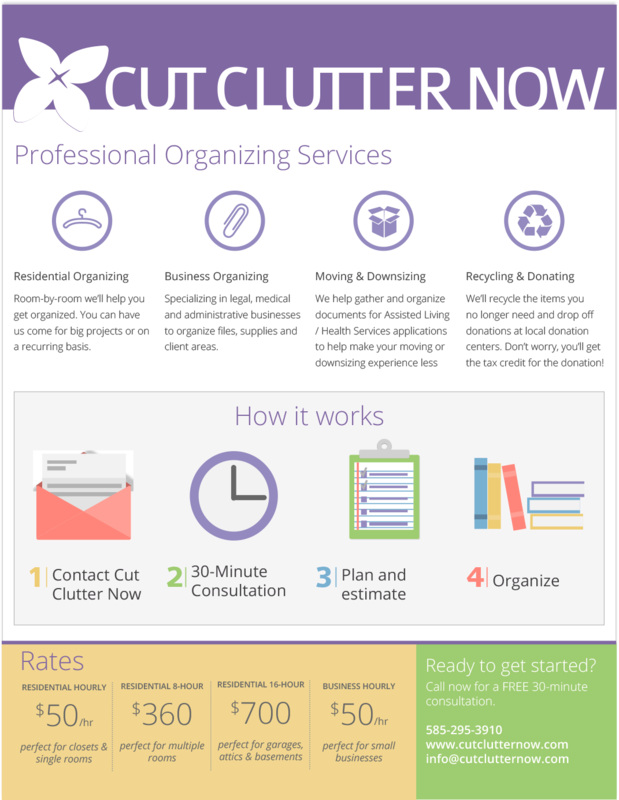 Cut Clutter Now has a defined service area in the greater Rochester area. As a result, they wanted their branding to nod to their local routes. The lilac, a flower often associated with Rochester due to its annual Lilac Festival, was something that Cut Clutter Now felt was important to highlight. The logo features a lilac graphic and clean, crisp logomark uses Collaborate and Open Sans. Purple is Cut Clutter Now’s primary brand color. Purple emphasizes the connection with lilacs, and secondarily, spring – a time of freshness and rejuvenation. The secondary colors are bright and cheery to showcase how you will feel when you have banished the clutter. Open Sans is the primary typeface used by Cut Clutter Now. It is simple and clean to align with what Cut Clutter Now hopes to do for its clients’ homes. 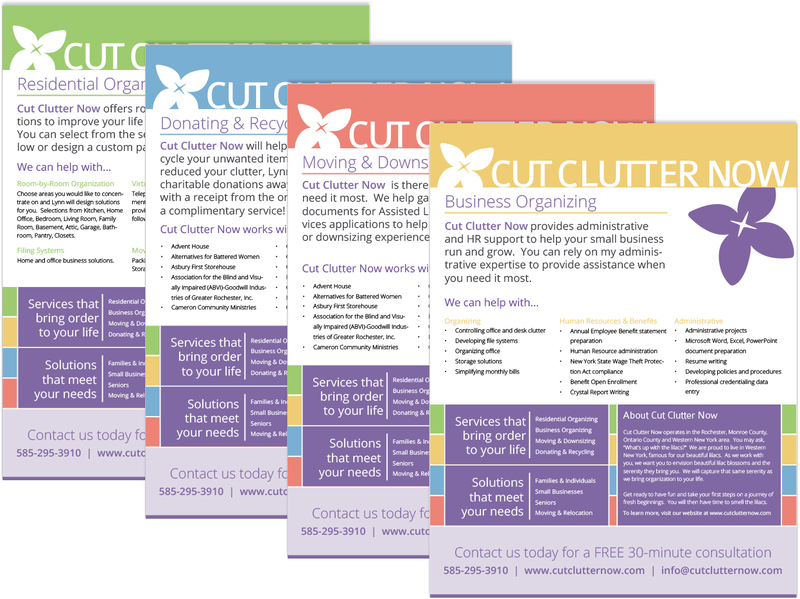 Cut Clutter Now depends on print collateral and promotional materials to get their name out there. I have designed business cards, overview fact sheets, gift certificates, pens (not shown) and magazine ads to help promote Cut Clutter Now. All items utilize Cut Clutter Now’s visual identity. 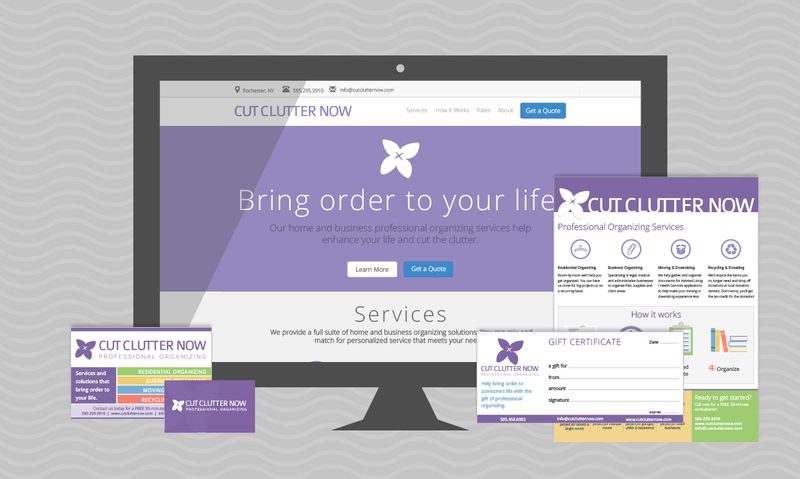 I’ve worked with Cut Clutter Now to update the design of their website. The visual design of the website is depicted below. I’m currently working on the development of the site, which should be launching soon!